Early this morning at approximately 3:00 a.m. Calcasieu Parish Sheriff’s deputies were dispatched to a local convenience store on Highway 171 in Lake Charles in reference to an armed robbery. Deputies learned the 3 suspects entered the store armed, where there were 2 employees and 3 children inside the store, and demanded money from the clerk. They stole an undisclosed amount of money, as well as personal items from store employees, and fled in a Hyundai Sonata. No employee or child was injured in the robbery. 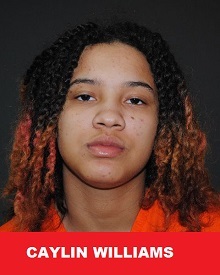 After viewing surveillance footage and further investigation detectives were able to identify the suspects as Caylin J. Williams, 20, 3640 Greinwich Blvd., Lake Charles; Terry R. Shepherd, 22, 106 Jupiter Lane, Iowa; and Chad Levier, 18, 3517 McKinley St., Lake Charles. Detectives along with the CPSO Patrol Division, CAT Team, and ACT-Team located Williams at her residence on Greinwich Boulevard. When deputies arrived at her house they located the Sonata used during the robbery. Williams refused to exit the residence but after deputies deployed tear gas they located her hiding in the attic. Deputies executed a search warrant on her residence and located items used during the robbery as well as items that were stolen. 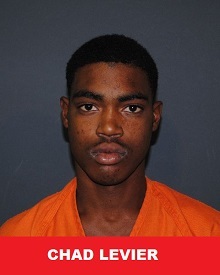 Shepherd was located during a traffic stop in Iowa, along with items from the robbery, and was taken into custody. While deputies were conducting surveillance on Levier's residence in attempt to locate him, they observed him leaving his residence on McKinley Street. Detectives conducted a traffic stop and located items that are believed to be stolen during the robbery in the vehicle. A search warrant was executed on Levier's residence, where they also found items used during the robbery. 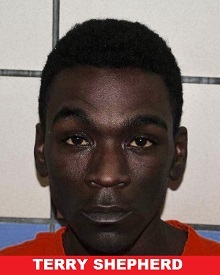 Williams, Shepherd, and Levier were all arrested and booked into the Calcasieu Correctional Center and charged with armed robbery; and armed robbery with the use of a firearm. Judge Guy Bradberry set Williams’ bond at $150,000 and Shepherd’s and Levier's bonds at $250,000. The investigation revealed that these 3 suspects are possibly responsible for another armed robbery that happened this morning that is being handled by the Lake Charles City Police Department. CPSO Detective Travis Lavergne is the lead detective on this case.